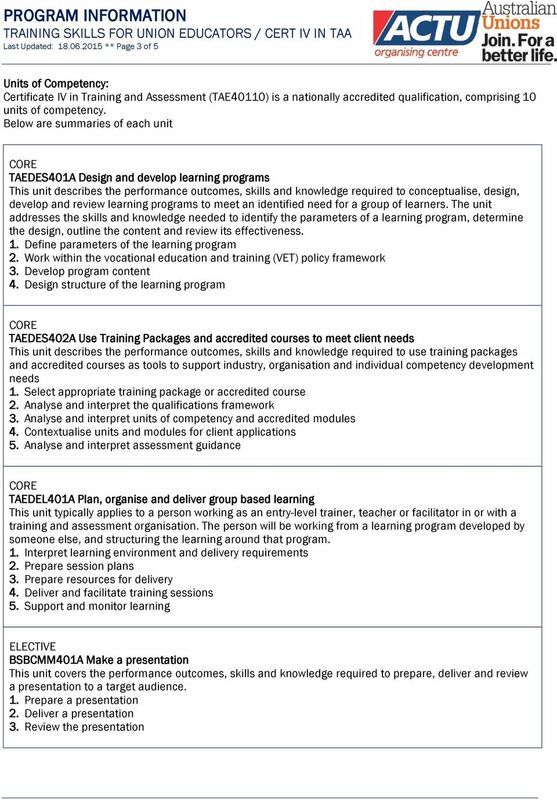 Download "PROGRAM INFORMATION TRAINING SKILLS FOR UNION EDUCATORS / CERT IV IN TAA Last Updated: 18.06.2015 ** Page 1 of 5"
2 Last Updated: ** Page 2 of 5 Topic and Units: Covered during Assessment Tasks: Deliver Training TAEDEL401A Plan, organise and deliver group-based learning BSBCMM401A Make a presentation TAEDEL402A Plan, organise and facilitate learning in the workplace TAELLN401A Address adult language, literacy and numeracy needs Competency Based Assessment (CBA) TAEASS301B Contribute to assessment TAEASS401B Plan assessment activities and processes TAEASS402B Assess competence TAEASS403B Participate in assessment validation Workshop 1 Reading / Learner Guides Answer general questions about training delivery Write and deliver a session on Write and deliver 2 consecutive sessions on units of your own choice Design and implement an Individual Work-Based Learning Plan (1) Design and implement an Individual Work-Based Learning Plan (2) Address LLN Answer general questions about CBA Plan and conduct an assessment of Plan and conduct an assessment of BSBOHS303B Conduct an RPL for Validate an assessment for Validate an assessment for BSBOHS303B To achieve Certificate IV in TAA, participants complete a number of assessment tasks. Some tasks will be completed during the Workshops. Participants need to allocate at work and home to complete remaining tasks. Participants complete each assessment task, sign the front cover and submit to their educator or Educators will assess and provide feedback. Participants have the right to appeal against assessment decisions made by an Educator. They should follow the Appeals Procedure available on the website. All discussion and outcomes will be documented in the participant file. Participants gaining TAE40110 Certificate IV in TAA may wish to continue their studies in the Diploma of Training and Assessment (TAA50104). Duration: Enrolment in the qualification is for 12 months. If needing more to complete assessment, they may request an extension up to a maximum of 2 years from the date of enrolment. After 2 years, if participants wish to complete outstanding work, they must re-enrol and pay for the course again. 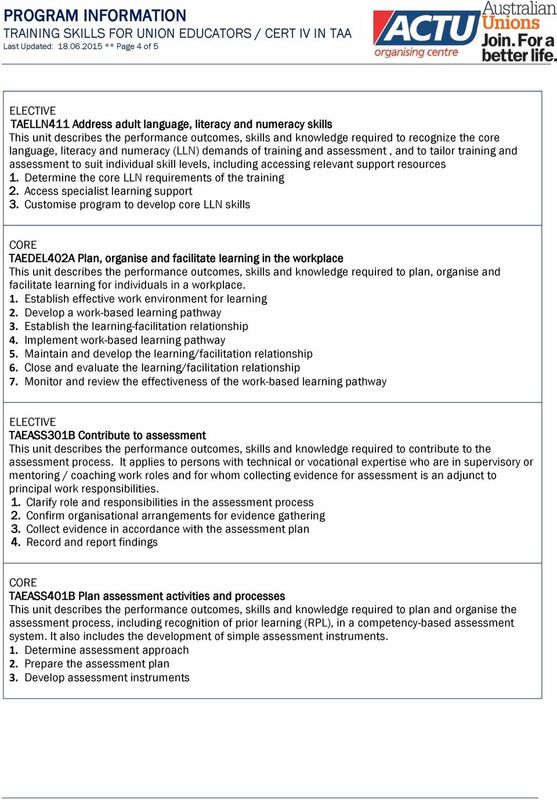 5 Last Updated: ** Page 5 of 5 TAEASS402B Assess competence This unit describes the performance outcomes, skills and knowledge required to assess the competence of a candidate 1. Prepare for assessment 2. Gather quality evidence 3. Support the candidate 4. Make the assessment decision 5. 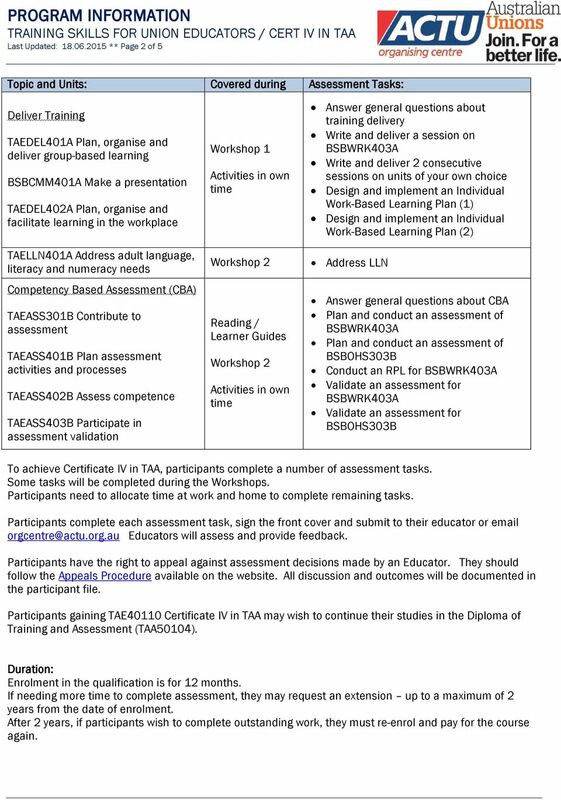 Record and report the assessment decision 6. Review the assessment process TAEASS403B Participate in assessment validation This unit describes the performance outcomes, skills and knowledge required to participate in an assessment validation process 1. Prepare for validation 2. Contribute to validation process 3. 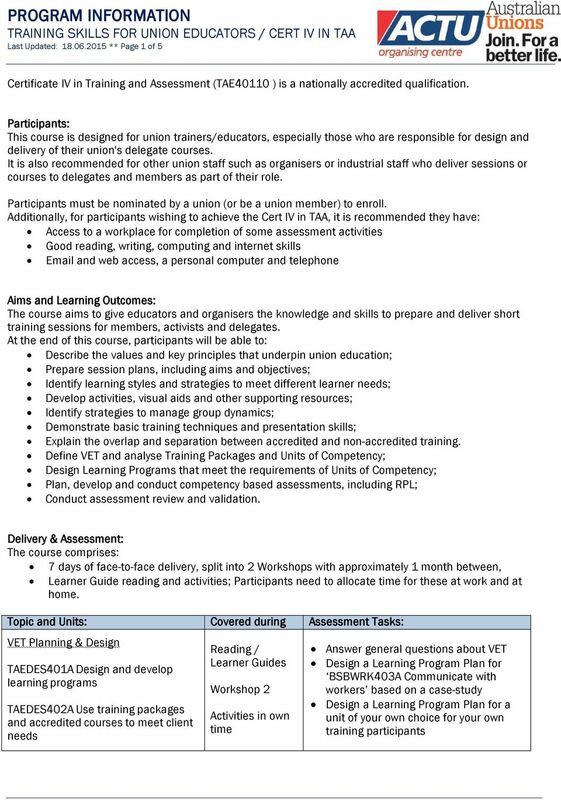 Contribute to validation outcomes RTO Policies: All participants of accredited training should be familiar with their rights and responsibilities when enrolled with ACTU Organising Centre. See our RTO Policies and Cancellations Policies available on the website. P a g e 0 TAE40110 Certificate IV in Training & Assessment Your Complete Learning Guide PO Box 13081 George Street BRISBANE 4003 http://www.tae.fortresslearning.com.au 1300 141 994 P a g e 1 WELCOME Welcome. Pre-enrolment Information Package 10336NAT Certificate III in TESOL (Teaching English to Speakers of Other Languages) 2013 Certificate III in TESOL Thank you for your enquiry regarding the above course.